HELLO. Once again we have reached the most cherished day of the week. The one, the only, the Caturday. 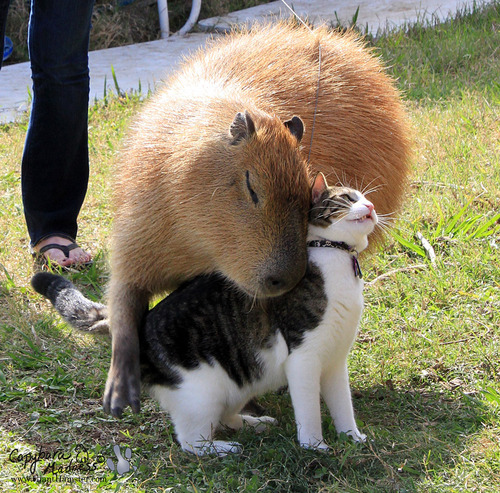 Today’s Caturday post is not only dedicated to the cat species, but also the the capybara. I love cats, we all know that. But the capybara has a special place in my heart simply because of the smug look on its face at all times. This photo, however, is a special one because you can see its little eye bending up a little and it is feeling TRUE HAPPINESS. This is the truest love I have observed ever in my entire life that I haven’t been a part of and where my cat wasn’t the other half of the relationship. I highly suggest you google pictures of capybaras and giggle at their smugness, because there is actually no other way to describe that facial expression. P.S. I’m working on a real post at this very moment so I’M SO SORRY IT’S BEEN SO LONG.